Nothing is more annoying or stinky than mixing your dirty laundry with your clean stuff when you are traveling. We have all been there, and the solution is usually a simple plastic bag, right? Well, after years of traveling and suffering the same problems as you with my dirty undies getting mixed up with my clean t-shirts, I thought it was time to find the best dirty laundry bag ideas out there! Check out the options and pick the one that best suits you. Don't dismiss one on first impressions though, some solutions are far more useful and creative than you might imagine. Below is a quick table to compare features and help you decide what kind of laundry bag to go for. 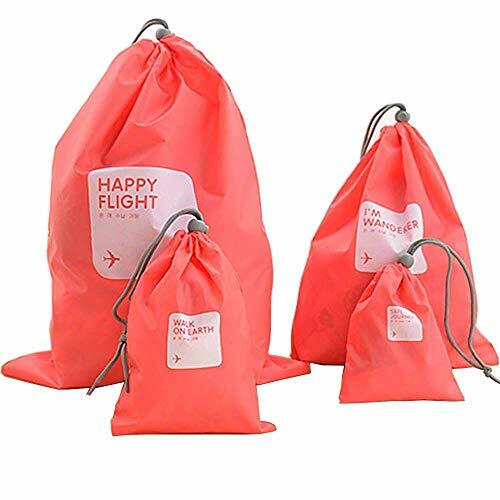 The first 3 are all simple laundry bags with drawstring closure, water resistance (don't expect 100%) and some of them are also backpacks (handy if you are traveling and need to carry it a distance to a laundromat). Below that are a couple of multi-purpose options including a bag that you can also use as a hand-washing machine, and a suitcase with a built-in laundry bag. Perhaps the simplest and most compact option out of the choices here, the Ezpacking laundry bag is a solid choice for any traveller. With a strong and durable nylon bag, you can usually never go wrong. It also comes with a simple drawstring to help keep the smell/odours in. Although, unlike the ziplock option further down, it cannot do that 100% (warning smelly sock owners, like me :>). Another strong point of this dirty laundry bag is that it is focused on folding and packing well. That means you can easily throw it into a carry on or large suitcase and it will take almost no room. Just don't lose it! It is also a nice blue color, which may suit people more than some of the other options below which are a little more boring. This is one of many options you will find online. A simple nylon dirty laundry bag. The benefit of this Nylon laundry bag is that it comes with shoulder straps (simple ones). So, if you need to carry your laundry to a laundromat or anywhere else (other than just the hotel reception) it is easy to carry. Looks just like a simple backpack really. Other points worth noting are that it is very strong (nylon) and durable, and easily folds or crumples for storage. 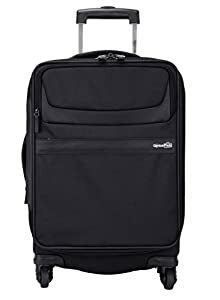 Something definitely worth thinking about when you travel, as you have to squeeze this in with all your clothes. It's also water resistant, which is not a big thing, but handy. And it has a useful drawstring at the top to keep your clothes, and most of the smell inside. This is probably the simplest and cheapest choice with the most options. You get 4 different bags, so you can choose to bring just a few or use them for other purposes, such as a shoe bag. 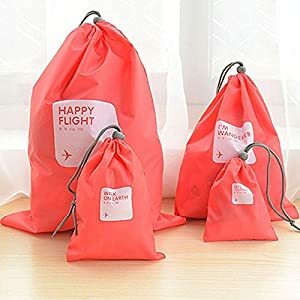 Keep in mind, these bags are quite small, so although you get the option of many bags, the other two simple bag/backpacks above are bigger than the biggest of these. So, they are great for small/weekend trips OR shoes/underwear or perhaps your swim gear (although I would use the ziplock below for that - in case it's wet). SMALL bags, so only useful for short trips or shoes, underwear etc. This is in essence just a simple plastic bag with a ziplock. Or is it? These guys are intended as almost industrial grade waterproof bags. They are certified down to 60 meters (180ft) and can stay down that deep for over 2 weeks. What does that mean? 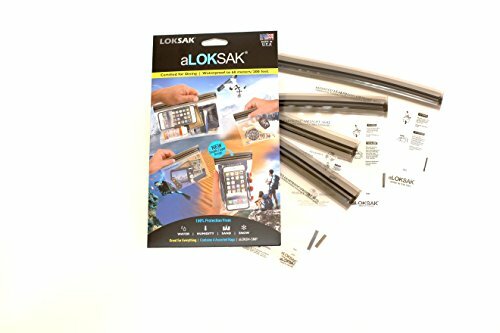 The plastic and the seals are very strong and durable​. Strong enough to keep the smell in for your dirty clothes! Another thing with this bag is that you can use it for other things, if you need to. Like waterproofing things when you do water sport, or just want to keep the sand off at the beach. 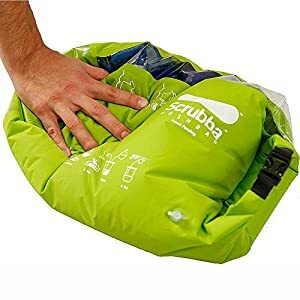 The Scrubba Bag is a bit more of a solid solution to the dirty laundry bag / washing machine combo idea that is possible using the aLOKSAC ziplock bag above. It is kind of a dry bag (used for keeping things dry while kyaking etc) used as a laundry wash bag - if you want to keep it simple. So, with this bag you can be sure it is going to last as well as solve your dirty laundry and washing machine issues while traveling. If all you do is go to hotels and give in your laundry for cleaning, this option is probably not for you. But, for the more independent traveller who often is stuck with a weeks worth of clothes and suddenly no laundry in sight (or maybe you are camping?). This is great. How does it work? It's best if you watch the video below, but basically you put in the right proportions of detergent and water and then scrub like your grandma used to do on the old washboards! Doesn't look like a dirty laundry bag? You are right. The team at genius have realized that we always have dirty laundry when we travel. So, why not build a dirty laundry bag into our luggage! Now, instead of having to worry about a separate bag, you just have to take your luggage. How does it work? Well, it is a separate compartment in the bag and on top of that, it is compressible, so it's easy to get all your dirty stuff in. And, avoid the bloated, not well packed, dirty laundry bag problem we all have! This bag also has a bunch of other useful features with the frequent traveller in mind (at last). Mobile charging unit (sold separately) and a handy spot to put it. Zip out water bottle holder, so you can slide in your water bottle while walking to the plane. Handy spot for an umbrella (sold separately) - useful for travellers who end up in wet locations! This is really an all in one solution for the frequent traveller who hates all those fiddling things we have to deal with! No matter what your specific needs when it comes to travel, there is an ideal dirty laundry travel bag solution for you. 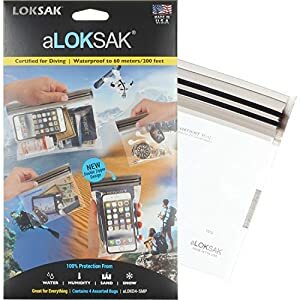 Whether it is a simple ziplock (instead of the crappy plastic bag) or a complete carry on bag with dirty laundry compartment, you have a lot to choose from. Take a detailed look at all the ideas and let us know which one you found the best for you!